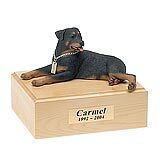 "I wanted to take a moment and thank you for such a wonderful product. 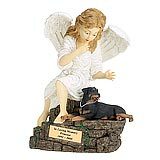 We ordered the Original Edition Angel for our beloved Watson who passed away in May. 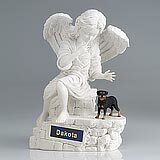 We knew we wanted something truly special for Watson and when my wife and I saw the Angel we knew we had found it. Thank you again for giving Watson such a wonderful place to rest." 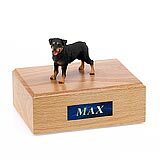 All available Rottweiler dog urns and memorials will be displayed with the figurine on the Rottweiler urn you select and in the appropriate size.